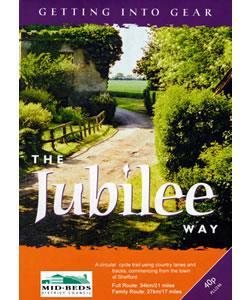 The Jubilee Way at Shefford Cycle RouteThis special cycle trail to mark the Queen's Golden Jubilee has been specially designed to offer something for cyclists of all standards. Starting in the historic coaching town of Shefford, the route winds its way south through an undulating landscape to the upper edge of the Chiltern Hills. The route offers you many opportunities to stop for refreshments, maybe a friendly village pub, or perhaps a picnic amongst the rolling landscape or by a duck pond in one of the picturesque villages. For those wishing to explore the full variety the area has to offer, we recommend cycling the full 21 mile route. Those with families or wishing to cycle the shorter route, simply follow the 'Family Route' directions. Start / Finish Point: Shefford Town Centre. Start Nat GR: TL143392. How to get there by car/parking: Shefford is located on the A507 at the heart of Bedfordshire mid way between M1 junction 12 and A1M junction 10. This special cycle trail to mark the Queen's Golden Jubilee has been specially designed to offer something for cyclists of all standards. Starting in the historic coaching town of Shefford, the route winds its way south through an undulating landscape to the upper edge of the Chiltern Hills. The route offers you many opportunities to stop for refreshments, maybe a friendly village pub, or perhaps a picnic amongst the rolling landscape or by a duck pond in one of the picturesque villages. For those wishing to explore the full variety the area has to offer, we recommend cycling the full 21 mile route. Those with families or wishing to cycle the shorter route, simply follow the 'Family Route' directions. There is a free town car park on Old Station Way, signposted from the High Street.